The blessed sun returned yesterday, and we luxuriated outside, lulled by the gentle gurgle of the sump pump drainage hose. When the sun revealed itself, finally, the grass made one of those cartoon noises -- something like: sproingggg, and grew three inches in three minutes. An enormous, silent osprey kited overhead, eying the children. If birds can do arithmetic, this one was. Let's see, the little one weighs about thirty pounds, give or take, and I've never picked up a rabbit that big, but he'd feed a family of four raptors for four weeks, easy. But he looks kinda doughty, and might struggle. Let's find a few chipmunks, what do you say? 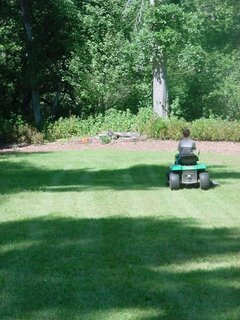 The big son was out of the question, of course; that's him mowing the lawn. The one barely three is the center of attention now, and charms us with his googoo and his antics. But the mellow ripening of the elder son into a little man is another whole enchilada of wonder for his father. 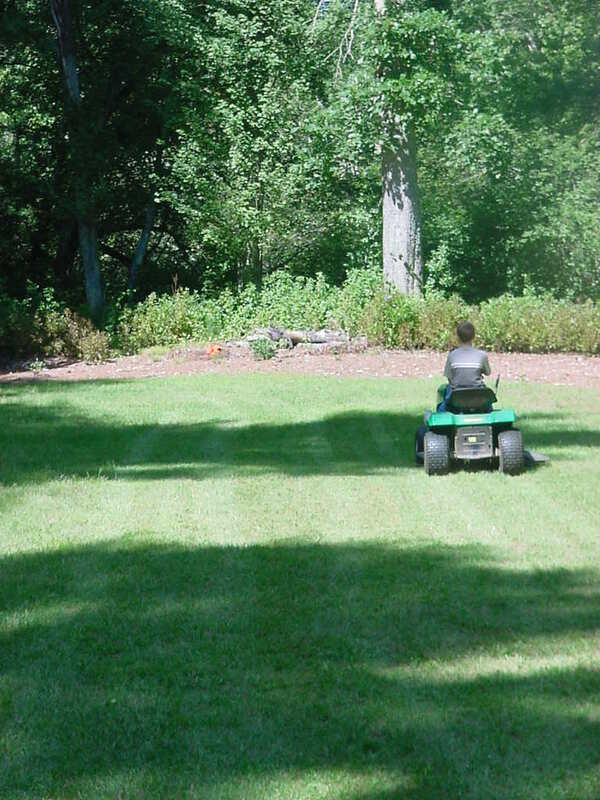 I still can't get over the idea that I have a child old enough and responsible enough to mow the lawn. I literally am in a kind of awe of him. He seems sometimes too good to be true. I wonder if he'll like me when he's grown. A man newly minted likes to put some distance between himself and his father, generally. You are left wondering if whatever affection he might have for you will trump his desire for independence, and drive him to mow your lawn when you really need some one to, not just because it's fun to watch him do it. And yes, I'm writing this because I manifestly love that little boy and his even littler brother, and the mother that raises them to be as charming as they are -- and because I'm too busy making furniture to finish the plan for the toybox today. One thing I've noticed about the two boys -- they eat a lot.